A groundbreaking study reveals that pollution from automobiles and coal-fired power plants is contributing to the melting of mountain snowpacks as much as a month early, thereby exacerbating water shortages and other problems across the parched western United States. The study, conducted by researchers at the Department of Energy's Pacific Northwest National Laboratory, is the first to explore changes to snowmelt caused by soot pollution at a regional level. The peer-reviewed study, which focused on snowpacks in the Rockies, Sierra Nevada and Cascade mountain ranges, is scheduled to be published next month in the Journal of Geophysical Research-Atmospheres. The study found that soot -- tiny particles emitted from automobile tailpipes and industry smokestacks -- eventually settles on the snow-topped mountains, powdering them with a dark layer that absorbs more sunlight and melts the snow weeks earlier. More alarming than early melting, however, are the effects to water supply, particularly in the summer months, when it is needed most. 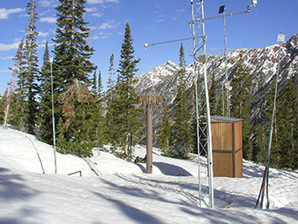 A series of monitors measures the snowpack and melting cycles. Courtesy of the Natural Resources Conservation Service. "The important thing is the change in timing of available water," explained William Gustafson, an atmospheric scientist at the Pacific Northwest National Laboratory and one of the study's primary authors. Earlier melting results in water that is stored in the mountains flowing down streams and rivers in the spring and early summer, "and that means less available water in the summer months when it's needed," Gustafson said. The consequences of this are enormous, researchers say, affecting everything from agricultural irrigation to recreational activities to the generation of hydroelectric power. Already, local governments and large power companies are spending tens of millions of dollars a year on artificial cloud-seeding projects designed to increase snowpack. And a number of Western states are involved in costly legal battles over access to water supplies that are dwindling, in part, due to the early snowmelt. Despite the importance of snow's reflectivity, it remains poorly studied. There are literally hundreds of monitors measuring temperatures in Western mountain ranges, but only five monitors routinely measure the snow's reflectivity, said Tom Painter, director of the Snow Optics Laboratory at the University of Utah and a leading expert on early snowmelt. "Really what we need is a lot more field studies to determine how much dark snow is at different locations, and how it impacts snowmelt at those locations," said Philip Mote, Washington's state climatologist who characterizes the national laboratory study as a very good first step. "This is a computer modeling study; we need more field study." Clean, white snow reflects most of the sun's energy back into the atmosphere. But darkening the snow with soot allows the snow to absorb more heat, thus increasing the temperature in the snow -- and the air above it -- by as much as 1.2 degrees Fahrenheit, according to the study. "Soot acts like tiny toaster ovens in the snowpack, and when the sun hits them, they heat up and melt the snow," said Charles Zender, an atmospheric physicist at the University of California, Irvine. Zender peer-reviewed the Northwest Pacific National Laboratory study and has studied the early snowmelt issue on a global level. The soot is helping accelerate the warming of the planet that scientists say is due mostly to another kind of human pollution source: greenhouse gas emissions. The warming climate has already significantly decreased mountain snowpacks across the West. For example, Gustafson points to studies that show that as much as 60 percent of the snowpacks in the Cascades have disappeared in the last five decades. And it is only going to get hotter; the Intergovernmental Panel on Climate Change in its influential report on global warming in 2007 estimated that average temperatures in the western United States could climb more than 7 degrees Fahrenheit by century's end. The panel, whose membership includes many of the world's leading scientists, also suggested that the role pollution plays in melting snowpacks is an issue worthy of more study. The soot pollution is part of a vicious cycle created when snowpacks melt early, the researchers say. "When darkening causes a snow surface to melt and expose the darker surface underneath, that surface absorbs more energy, and that could potentially produce regional warming," said Mark Flanner, a postdoctoral fellow studying the effects of pollution on snowpack at the National Center for Atmospheric Research in Boulder, Colo.
That is one reason why Zender said the Pacific Northwest National Laboratory study may underestimate the effects of soot pollution on snowmelt. Zender and Flanner have co-authored a study set to be published next month that Zender said will show that soot is as big a contributor to early snowmelt as the warming climate. "It's clear that where you have any overlap between snowpack and pollution sources, you accelerate the snowmelt," Zender said. The Northwest Pacific National Laboratory study focused on the western United States because many of the mountain ranges are close to major urban areas that are responsible for most of the soot pollution, the researchers said. 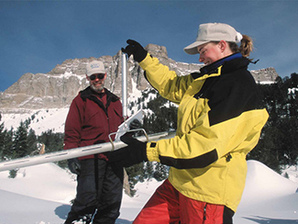 Surveyors monitor the snowpack as part of an effort to provide seasonal water supply outlooks for use by western U.S. water managers. Courtesy of the Natural Resources Conservation Service. Also, mountain ranges as far east as Colorado are affected significantly by soot produced hundreds of miles away in Los Angeles, San Francisco and Seattle because the predominant winds blow from the Pacific Ocean in the wintertime, moving pollution inland for thousands of miles, said Yun Qian, an atmospheric scientist at the Pacific Northwest National Laboratory and the lead author of the study. However, one of the biggest sources is soot that drifts thousands of miles across the Pacific Ocean from China and other rapidly developing countries. Numerous studies have confirmed that pollution is blowing across the Pacific and into the western United States and Canada each spring. What's more, that pollution is contributing to warmer temperatures at higher altitudes in the West, according to a March 2007 study led by researchers at the University of California, San Diego. Those researchers found that the pollution transported overseas has a "significant heating effect" at altitudes above 6,500 feet. Of particular concern is the fact that the overseas soot is heaviest in March and April, Zender said. "That's the time when the most snow is on the ground," he noted. "So the Asian emissions of dust and soot occur at the same time our snowpacks are most vulnerable." But man-made sources of soot are not the only threats to snowpack. In the San Juan Mountains of southwest Colorado, researchers at the University of Utah determined that dust storms in 2006 that originated hundreds of miles away coated the snowpack with a brown layer. Like the black soot from tailpipes and smokestacks, the dust heated the surface and caused the snow to melt as much as a month early, according to a 2007 study led by Painter, the University of Utah researcher. Painter and his colleagues determined that the dust affecting the San Juan Mountains snowpack originated in the Colorado Plateau, which includes parts of Utah, Colorado, New Mexico and Arizona. The likely cause: expansion of grazing, agriculture, mining and increased recreational use of the land that is exposing soils to the wind, which in turn lifts the dirt into the atmosphere. "These land-use changes have disturbed desert soils and increased windblown dust," a NASA analysis of the study concluded. The problem continues on the San Juan Mountains today, Painter said. "Whenever we have fresh, relatively clean snow at the surface of the mountain, the runoff is muted," he said. "As soon as the dust levels come back, you can see that the runoff starts back up." Flanner said this illustrates the sensitivity of the natural processes involved in snowmelt. "If you change reflectivity of the snowpack by even 1 or 2 percent, you have a noticeable effect on the melting of the snow," he said. The melting snowpacks have dramatically affected water supplies in California, Colorado, Montana, Wyoming and other Western states that rely almost exclusively on snowmelt for drinking water and irrigation. Many Western states are in the middle of a decade-long drought that is stressing already fragile water resources. A further shortage of water due to decreased snowmelt could cripple new development and slow energy production, as well as disrupt long-established industries like agriculture and ranching. These concerns have sparked interstate legal battles over the use of water by upstream states. The U.S. Supreme Court is poised to decide the interstate disputes between Wyoming and Montana and between Kansas, Nebraska and Colorado (Land Letter, Nov. 6). That is one reason why the issue needs to be better studied and solutions devised, said Qian, the lead author of the soot pollution study. "If we can project the future -- how much water we'll be getting from the rivers and when -- then we can better plan for its many uses," Qian said. "Snowmelt can be up to 75 percent of the water supply, in some regions. These changes can affect the water supply, as well as aggravate winter flooding and summer droughts." The early melting has caught the attention of government leaders and the energy industry, which have been working for years to increase snowpack by "seeding" clouds with chemical agents to produce more snow. Several huge cloud-seeding projects are under way. The Los Angeles City Council voted in June 2008 to start an $800,000 cloud seeding project designed to put more snow on the San Bernardino Mountains and provide more water in the summer to the large urban area. And Pacific Gas & Electric Co., one of the country's biggest power companies, last month began an ambitious weather modification project in Northern California to seed clouds in the Cascade Mountains in an effort to recharge two rivers powering nine hydroelectric plants that produce electricity for about 575,000 homes (Land Letter, Nov. 20, 2008). Less water flowing down mountain rivers in August and September, when the demand for electricity rises with the temperature, could cripple hydroelectric power plants that produce about 15 percent of California's electricity, according to PG&E. But the soot pollution could hinder those efforts, said Gustafson, the co-author of the Pacific Northwest National Laboratory study. "If you're seeding the clouds and producing more snow, you'd like to see it last longer on the ground," Gustafson said. And as temperatures rise, he said there are going to be fewer areas with climatic conditions that are suitable for snow, "so there's going to be less areas to seed." The only real solution, experts say, is to reduce pollution. That means slashing soot levels emitted from automobiles, especially diesel-powered trucks and buses, and requiring industrial sources to be cleaner. It also means working with China and other Asian countries to reduce soot and other particulate matter, which have been linked to major health problems. "Cleaning tailpipes reduces greenhouse gases, improves health and cleans snowpacks," Zender said. "It's a triple win for everyone." Scott Streater is a freelance journalist based in Colorado Springs, Colo.